Earth's surface is 71% water. Make the most of it! If you are looking for a great multi-purpose sit on top kayak, Aquamarine Sports has spotted this great find: The Wilderness Systems Tarpon 100. The Tarpon 100 is a 10-foot sit on top kayak with a moderately wide beam, making it a stable choice for beginners and inherently useful for seasoned kayakers as well. The Tarpon 100 is equally at home on the lake, ocean bays and inlets and quiet rivers alike. You can even take it out into the surf to mess around! Maybe not the intended use, but some owners have even used it on Class 3 rapids with success. It’s wonderful for fishing and camping too. What’s not to love? If you are looking for quick info, click here to see pricing and features of the Tarpon 100 at Amazon. 8 Did we mention serious payload capacity? 9 How hard is it to move around? 11 What’s it made of? 13 Who is this kayak for? 14 Can you stand up in it? 15 What’s this thing cost? 16 Are there any downsides? 17 Want it already set up for fishing? 18 What do we recommend? 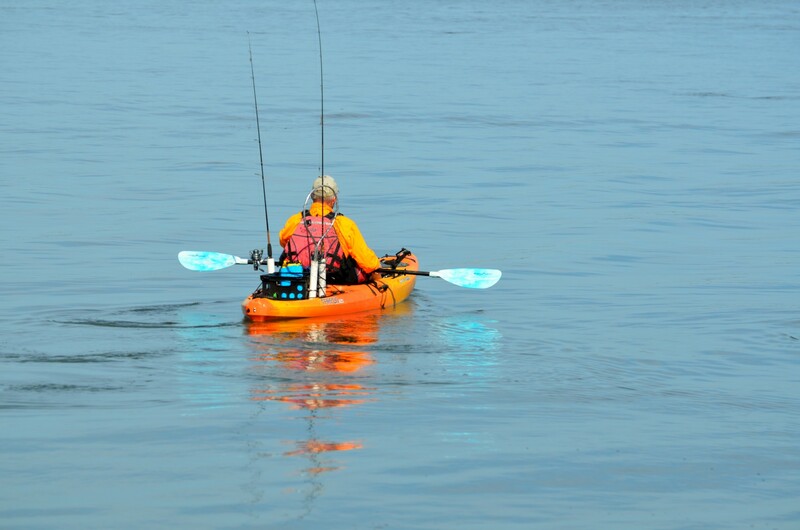 One of the outstanding features of the Tarpon 100 kayak is the stability. At 30.5-in wide, it is nearly impossible to tip, even in choppy conditions or when reentering the kayak from in the water. Beginners will find this feature particularly inviting. Seasoned pros will appreciate it and fishermen will require it. For a relatively short kayak, the Tarpon 100 has great tracking ability. You shouldn’t have any problems staying on the straight and narrow. The short length of the kayak gives you greater maneuverability in tight areas. The seat is Wilderness Systems’ patented Phase 3 AirPro sit on top seat. It is a mesh fabric that is stretched over a perforated foam form. It has plenty of airflow to keep you dry and cool and it’s great support for your back and rear end. This seat is just MADE for the long trek. You can sit for hours without getting a sore behind. It’s adjustable too. The seat lifts at the legs and the back raises up and down. Quick fold-down for easy transport and storage, and set up in place with bungees and clips. The foot braces are adjustable to suit your leg length and extension preferences. Easy to adjust on the fly. Just squeeze the release and move to where you need. The shorter length of this kayak makes it agile and especially able to maneuver light rapids and low streams. Getting around tight inlets and bays is a breeze too. And it glides smoothly in even the most shallow water. Self-bailing scupper holes keep the water from swamping the kayak. But if you are going to be doing a quieter activity that doesn’t involve a lot of splash into your kayak, you may want to put in scupper plugs for a dryer floor. There’s lots and lots! The two 8in. Orbix access hatches at bow and mid-boat allow access to the interior of the kayak. They’re easy to open with one hand too. Just flick the lever and pull up….you’re in! Beats the two-hands-required unscrewing necessary with other yaks. You’ll need to use the hooks if you have small things you don’t want to get lost out of reach. But there’s plenty of room inside, even for a fishing rod, if you put it in just right! The rear has a tank well with bungee cord that’s big enough for your bait bucket and milk crate, your tackle box, your camping gear. Even a dog or small kid! There are two handy little storage pockets just below the seat for your sunscreen, your waterproof camera or whatever you need to keep handy (but not dry!). There’s a cup or bottle holder too. Some people think the cup holder doesn’t work well, and it might not, if you plug your scuppers and get flooded and your plastic bottle floats out. Could happen, but that’s worst-case scenario. Plenty of bungees too. There’s one on each side for a paddle keeper and another on the front floor. Did we mention serious payload capacity? This little kayak sports a payload capacity of 325 lbs! That’s enough for you, your fishing tackle, and your camping gear….and drinks. Good to go! How hard is it to move around? Well, it weighs 55lbs. so it’s not a total lightweight. But it’s fairly short, so you and a buddy can heft it up to your roof rack, strap it down and be on your way for the weekend. It’s got two carrying handles at bow and stern and one on each side. Some people say their handles deteriorated after a few years, but that they were easy to replace. Tracks abound on the Tarpon 100. Plenty of space for rod holders, GPS, fish finder, camera mounts or whatever floats your boat. If you want the Angling Package, consider the Tarpon 100 Angler. We will talk about that a little more below, so read on. That would be rotomolded polyethylene plastic. Super durable and shock resistant. It’ll take a beating and come back for more! If you are interested in how it’s made, check out the materials section of our article on choosing a kayak. There’s a neat video there you might find fun! The Tarpon 100 comes in a nifty selection of six grooving colors to suit your personality. There are red and lime green solids. The other colors (Desert Camo, Dusk, Flint, Indigo, Galaxy, Mango, Midnight and Sonar) are variegated color combinations that are each uniquely made in the factory and will differ for each individual kayak. So you can customize your color preference. Who is this kayak for? Anybody who wants to have some serious fun. No really, it’s a fantastic find for a beginner. The stability will make it easy for the beginner to enter and stay seated. It glides comfortably, so no problem there. But the more experienced paddler will also appreciate these features, especially for the price. It’s not really meant for serious rapids. It is a sit on top, after all. But you can do some gentle rapids in it. Mostly, it’s for flatwater use: sport fishing, paddling lakes, lazy rivers and ocean inlets. Can you stand up in it? Yes…..but. It is indeed very stable and can handle you standing up in it, but the floor area does not lend itself to comfortable standing. There is really only a small place to stand right in front of the seat. To see pricing and other featues, you can click here for more information. Not really. You do have to consider what you plan to use this kayak for. It is not what you might consider a “fast” kayak because it is relatively short. It really isn’t built for speed. It is built for stability, maneuverability and comfort. If you want more speed, you might consider the longer versions of this craft, the Tarpon 120 and the Tarpon 140. They have essentially the same features and the extra length will help with the speed and tracking. Just remember that longer means you need to consider your transportation situation in a different way. Want it already set up for fishing? If you want to get your Tarpon 100 pre-outfitted for fishing, you might consider the Tarpon 100 Angler. It comes with the Yakattack angler package. This includes a 1-in. screwball, a 1.5in screwball, a Mighty Mount, a VisiCarbon Pro safety light and a Zooka Tube rod holder. Of course you can accessorize with all kinds of things after that, so let your imagination run wild! See the Tarpon 100 Angler features and pricing here. This really is a great little kayak. We might even say it’s the best sit on top kayak in its class! It’s got an awesome package of features and highlights all in one boat for a spectacular price. If you have never owned a kayak before, this may be a great one to start with. If all these great features make you just want to own this thing right now, click here to go to Amazon and get your new Tarpon on the water! This entry was posted in Kayak Reviews, Sit On Top Kayaks and tagged kayak review, sit on top kayak, tarpon 100, wilderness systems on May 25, 2016 by Diver T.
Great looking Yaks, can you tell me if the seating has adequate drainage, i don’t like sitting in water all day if i get my seat wet? i like the colour varieties as well. i think i will go for the camouflage. Thanks for the question, Carl. The Tarpon 100 does have self-bailing scupper holes to keep your rear end as dry as possible. You can also plug these when you are on calm waters and not expecting a lot of splashover. Camouflage is great for fishing…good choice. I’ve been looking for a Kayak to go fishing in and this looks ideal with the storage space. Thanks for the tip about the Tarpon 100 angler – that will save me a lot of time instead of getting extra mounts fitted. Now the only thing I need is a new rod too. This does look perfect for a beginner. I have tipped a kayak before, so the stability and comfort are a big deal. Thanks for the post! I’ve never bought a kayak before but I’ve used plenty. It looks like these things don’t come with paddles. Is there a certain type of paddle I should buy with this or are they all pretty much the same? Choosing a paddle can be very individual. The most important thing is having the appropriate length for your arm length. After that, it’s about weight and price. Bookmark this page for future articles on choosing the right paddle. 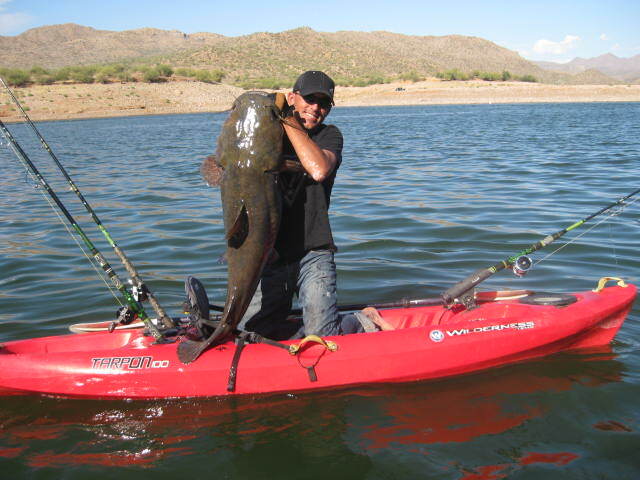 In the meantime, you can visit the page on choosing the right kayak here. Absolutely, Nick. The Tarpon 100 has a payload capacity of 325 lbs! And the rotomolded polyethylene hull is very durable as well. It can take a licking. AquamarineSports.com is a participant in the Amazon Services LLC Associates Program, an affiliate advertising program designed to provide a means for sites to earn advertising fees by advertising and linking to Amazon.com. Using these affiliate links will not increase your purchase price and will help us keep our site running so that we can bring the best information and deals to you.